The Secret Life of Pets | Anime etc. Amid the confusing array of computer cartoons, the Illumination studio stands out through its mascots – the yellow-skinned “Minions” from Despicable Me (2010), Despicable Me 2 (2013) and Minions (2014). 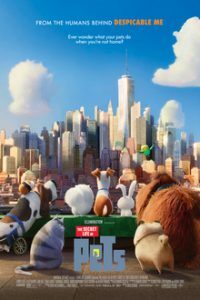 Apart from a post-credits gag, the Minions aren’t in Illumination’s The Secret Life of Pets, but they appear in their own raucous short cartoon before the feature (they go gardening). Directed by the Minions’ co-creator Chris Renaud together with Yarrow Cheney, Pets is raucous enough in its own right. It’s a shapeless chase comedy in which animals – Pets starts with dogs and cats, then throws in everything from a hawk to an alligator – chase each other round Manhattan. The film’s ‘centre’ is supposedly the rivalry between two dogs. A Jack Russell and a hulking Newfoundland, voiced by Louis C.K. and Eric Stonestreet, resent sharing the same owner; the set-up isn’t so different from the first Toy Story (1995). However, this strand is nearly buried as more and more animals are introduced. Even the broad joke suggested by the title – that ‘pets’ get up to mischief and anarchy when their owners leave them alone – gets buried too, especially when a menagerie of sewer-dwelling abandoned animals appear, led by a shouty rabbit villain voiced by comedian Kevin Hart. Pets looks as spectacular as we’d expect from a 2016 computer cartoon, opening with a lavish flyover of Manhattan, though the final shot is more touching, showing the pets and owners happy in their respective apartments in a utopian parody of Hitchcock’s Rear Window (1954). The animals themselves look pleasingly quirky, deliberately less cute than they’d be in a Disney film. But while I saw Pets with an appreciative audience, I soon found it disappointingly boring. Whereas the Minions – like classic characters such as Bugs and Daffy – were funny no matter what they were doing,Pets’ characters don’t have that level of cartoon charisma, and their adventures start to feel like rote escapades. I preferred the daffier animal antics that punctuated The Lorax, 2012, Illumination’s most disliked film. In particular, Pets’ two rivalrous dogs, called Max and Duke, treat each other so nastily in the first act that it’s hard to root for them as either heroes or antiheroes. Dismayingly, the film later tries to persuade us tocare about the pair. Minions, for one, would never have bothered with such nonsense, and it was funnier for it.